The rage is understandable, but we are not helpless. There is something we can do. 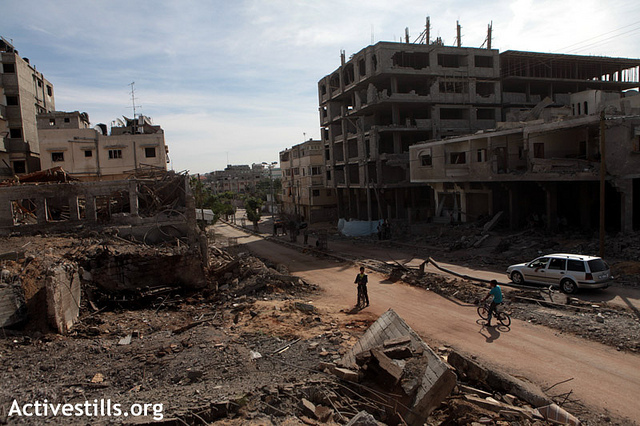 From inside Gaza comes this compelling call to action, via the international BDS Movement. “We Palestinians trapped inside the bloodied and besieged Gaza Strip call on conscientious people all over the world to act, protest and intensify boycotts, divestments and sanctions against Israel until it ends this murderous attack on our people and is held to account. 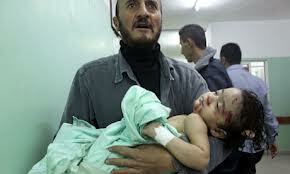 With the world turning their backs on us once again, we in Gaza have been left to face massacre after massacre. 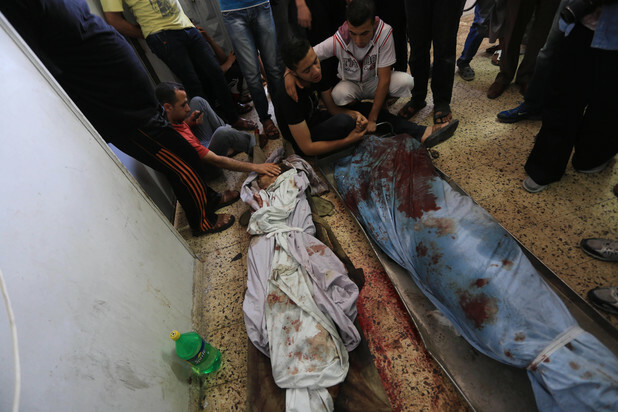 As you read these words, over 120 Palestinians are dead now [157 by July 14, with no end in sight], including 25 children. Over 1,000 have been injured including countless horrifying injuries that will limit lives forever –- more than two thirds of the injured are women and children. Join the growing critical mass around the world with a commitment to the day when Palestinians do not have to grow up amidst this relentless murder and destruction by the Israeli regime. When we can move freely, when the siege is lifted, the occupation is over and the world’s Palestinian refugees are finally granted justice. March 22 (World Water Day) to March 30 (Palestinian Land Day) marks the first International Boycott Week Against Mekorot. Israel’s national water company, Mekorot oversees the water apartheid policies of the Israeli state, stealing water from under Palestine to supply the needs of Israeli communities and illegal settlements, then selling the dregs at inflated rates to Palestinians. 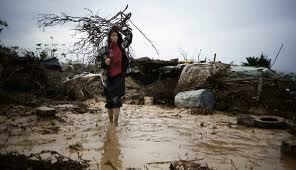 Palestinians are forbidden to drill wells, and the Israeli army regularly destroys water tanks that gather rain-water. Mekorot also profits from exporting its water privatization methods to other countries, turning water from a life-essential into a luxury commodity. But recently, due to an escalating international boycott campaign, Mekorot has lost multi-million dollar contracts in Argentina and the Netherlands. The Stop Mekorot campaign has just released a biting two-minute satirical video, Mekorot: An Apartheid Adventure. More on the Palestine water story in Our Way to Fight: peace-work under siege in Israel-Palestine. Here is American journalist Max Blumenthal’s deeply perceptive, moving account of his recent travels through the Negev Desert, where the Israeli government is poised to implement a plan for the expulsion of 40,000 indigenous Bedouin citizens of Israel from their ancestral Negev Desert communities and “concentrate” them in state-run, reservation-style townships. Former Bedouin homes, Negev Desert. Image: Occupied Palestine. 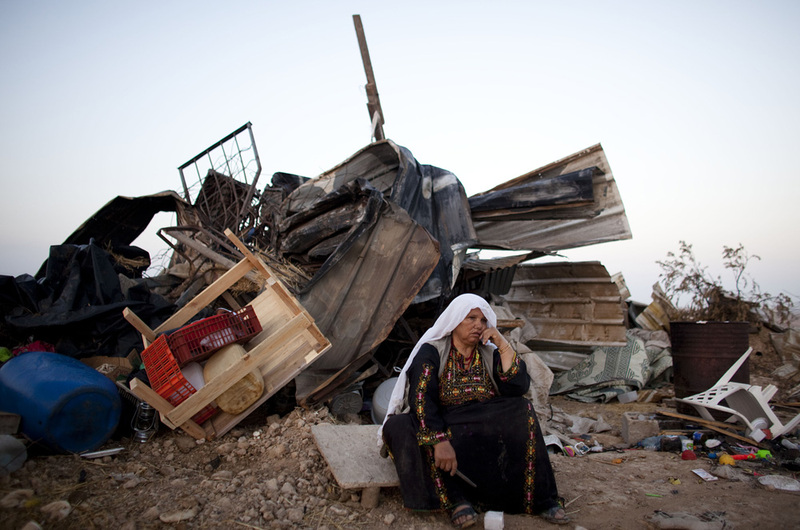 The Prawer Plan will extend to Bedouin Israeli citizens the same treatment that Palestinians have endured for decades. It is grimly reminiscent of South Africa in the depths of apartheid, and North America through several centuries of ethnic cleansing of indigenous peoples. Max Blumenthal: “The Prawer Plan is only one element of the government’s emerging program to dominate all space and the lives of all people between the river (the Jordan) and the sea (the Mediterranean).” This from the state that claims to be ‘the only democracy in the Middle East.’ Hence Blumenthal’s choice of title: The desert of Israeli democracy. Please read his account here. As residents of Prince Edward-Hastings riding in Ontario, Canada, we call on you to exercise your influence and responsibility in the following matter of urgent concern to all of us. As of October 1, Canadian citizens John Greyson and Dr Tarek Loubani have already been imprisoned for 46 days by the military government in Egypt. This past weekend their imprisonment was extended once again, for an additional 45 days. They have not been charged with any offence. We are encouraged to hear that the Prime Minister finally told Canadian media on Sunday, “In the absence of charges, Dr. Loubani and Mr. Greyson should be released immediately.” This is a step in the right direction, but given the life-threatening circumstances it’s inadequate. The Prime Minister should be speaking directly to his counterpart in Egypt, demanding that these two Canadian citizens be released immediately and allowed to return safely to Canada. John Greyson is an award-winning film and video maker, Dr Tarek Loubani an emergency room physician in London, Ontario. Both of them teach at universities in Toronto and London. Each is highly respected in his field. On the night of their detention, Dr Loubani was doing what his professional oath as an MD requires of him, helping people who’d been injured in protests. John Greyson was doing what he intended to do on this trip, documenting Dr Loubani’s work. To protest both the injustice and deplorable conditions of their detention, they are now in the second week of a hunger strike. Each day that passes, their health is at greater risk. Amnesty International has called for their immediate release. More than 140,000 people have signed an international petition demanding their immediate release. Their release has also been demanded by the Ontario & Canadian Medical Associations, the United Church of Canada, the Presidents of York, Ryerson, Queen’s and Wilfred Laurier Universities, and many other organizations and individuals. From a rural distance, the city of Toronto dazzles. It also puzzles me. I gather that the municipal government there faces enormous challenges, and ever-shrinking resources. Same dilemma in the small rural county where I live. 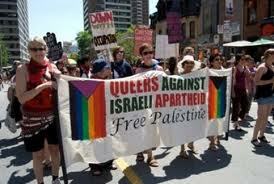 How then do a few municipal councilors in Toronto get away with wasting so much time and public money on their perennial campaign to silence one apparently small but – judging by the degree of their hostility to it – surprisingly effective community group, Queers Against Israeli Apartheid? Year after year a handful of councilors keep trying to silence it. No matter how many times they’re told by city legal staff that they have no legal grounds for doing so, no city legislation is being contravened, they keep trying. When the majority of their fellow councilors fail to join their campaign, the determined few use executive fiat to delay or shut down debate. When they fail to bully city hall staff into producing an illegal legal decision, they dangle a bribe – really, what else can you call “a diversity bonus”? – if the Pride Toronto organization will do their dirty work for them by booting QuAIA from the big parade. Year after year, intimidation, bullying, slippery maneuvers to short-circuit democracy. This is bizarre – isn’t it? Well, so it looks from a rural distance. Of course such things happen in small rural counties too, but somehow the stakes seem – well, smaller, less dangerous. Then again, from a historical perspective this attempt to silence dissent is not unfamiliar to me. In 1968, my 24th year, homosexuality was still a crime in Canada, and still widely considered a mortal sin and a mental illness. That year, in a desperate bid to convert, I endured a year of electric shock ‘therapy’ at the hands of a psychiatrist. I would now call it torture. Recovering in the early 1970s, I came out, became a gay activist and a writer. On a giddy summer day in 1981, I co-hosted Toronto’s first official Lesbian and Gay Pride Day, in Grange Park. By then it was no longer a crime but still an act of defiance to celebrate our Pride in public. Our grounds for pride: we defied fear and bigotry, we refused to be silent, and we demanded justice and equality – for all. We understood that human rights have no boundaries. Then as now, some people, including some of our own tribe, told us to shut up, go away, stop ‘rocking the boat.’ But then as now, if a boat needs rocking, I’m with the rockers. Which brings me – or took me – to Israel-Palestine. My latest book, Our Way to Fight, explores the lives of grassroots Israelis and Palestinians who defy the dominant politic to build grounds for a just peace in Palestine-Israel. It was from Jewish Israelis that I first heard the phrase “Israeli apartheid,” which they acknowledged with anguish. At first it was shocking to hear, but since then it’s been confirmed again and again by actions of the Israeli government, and by a range of eminent authorities on international law, including South Africans who know apartheid when they see it. It sounds remarkably similar to the Toronto councilors’ campaign to silence Queers Against Israeli Apartheid. In my experience this kind of arrogance is not unusual, it’s not limited to Israel’s backers, and it’s not exactly arrogance. When people feel they’re losing an argument, often they become angry and defensive, and do what they can to silence their antagonist, or failing that, to shut down debate. It seems almost perversely ironic that the more these councilors try to suppress any criticism of Israel’s military occupation, the more attention they draw to its brutal realities: Every day more Palestinian homes bulldozed by the Israeli army, more Palestinian land stolen, more new Jews-only homes built on it, more olive groves burned by settlers, more Jews-only roads, more night raids on Palestinian villages, more non-violent protestors tear-gassed, shot with rubber-coated steel bullets, arrested and beaten, more Palestinians imprisoned without charge, more torture, more killing. Every day, more apartheid. From a rural distance, having seen what I’ve seen, I can’t help thinking it’s about time Toronto’s elected representatives told the bullies among them: Enough – no, too much already – not one more day. Q (usually rhetorical, not wishing to hear an answer): Where are the Palestinian Ghandis? A: Through six decades of Israeli military occupation, countless Palestinians have engaged in nonviolent resistance to the occupation. Many Ghandis have been killed by the Israeli military, and several thousand are currently held in Israeli prisons, many without charge. The Israeli authorities keep trying to break the resistance with terror and violence. Non-violent resistance complicates their perpetual propaganda goal: to equate Palestinian resistance with terrorism, and to portray Israelis as perpetual victims. But still, despite everything, resistance continues. This is the story of one Palestinian Ghandi who needs our help – or at least our voices. Can you imagine what it would be like if military forces came to your home in the middle of the night, searched your mother, brother, and sisters (including a young child), ransacked your family’s belongings, blindfolded and arrested you, all without any known charges? Will you stand with us to take action and demand Hassan’s immediate release? For years, he has been organizing Palestinian youth throughout the West Bank to defend their human rights, develop leadership skills and mobilizing nonviolent resistance to the Wall and to the Israeli occupation. 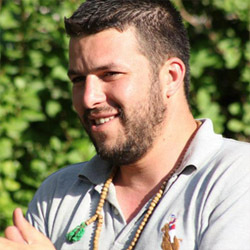 Hassan played an important role in the coalition of youth groups, farmers and trade unions which, together with international supporters, came together in January to occupy land in an area slated by the Israeli government for settlement expansion in the West Bank, Bab Al-Shams. Is it a coincidence that Hassan was arrested just two weeks after the Israeli government forcibly evicted Palestinians from this area? For the past two weeks, Hassan has been held in an interrogation facility, and has reportedly been badly beaten. No known charges that have been brought against him, and as of this writing he has not been allowed to see his lawyer. This is not the first time that Israeli forces have detained partners of Grassroots International without charges. Recently leaders of both Stop the Wall and the Union of Agricultural Work Committees were summarily arrested and thrown into detention facilities. Your action – and the support of thousands of others like you – successfully pushed for the release of human rights defenders in the past. Together with the efforts of Stop the Wall and international allies, we can do it again, at the same time demanding an end to the criminalization of all human rights defenders and social movements everywhere that fight for rights to land, water, and food sovereignty. “We will not be silent,” Hassan Karajah said. Please take a minute to make your voice heard on behalf of Hassan, here via Grassroots International, or here via Stop the Wall. Jewish Voice for Peace, Washington: “SodaStream is an Israeli company with its main factory in the industrial park of Ma’aleh Adumim, the largest Israeli Jewish settlement in the West Bank. According to international law these settlements are illegal. “According to research by the Israeli group Coalition of Women for Peace, operating in the settlement provides SodaStream profitable advantages – low rent, a labor force that is easily exploited, special tax incentives, and lax enforcement of regulations. 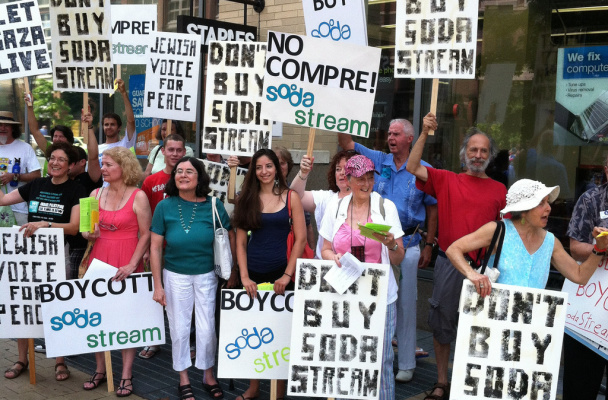 Whether or not you’re involved in the growing grassroots campaign to boycott SodaStream, please keep a copy of this guide for your own use, and to share with anyone you know who may be tempted by SodaStream’s ever-expanding marketing campaign. Any suggestions, corrections, and other feedback, write to henry@norr.com. If, after making all those mental calculations, you’re convinced that buying your own machine makes sense, you still don’t have to go with SodaStream. Sure, for now it’s the best known and most widely distributed brand in its category, but there are several alternatives that offer similar convenience and potential savings – but aren’t manufactured in an illegal settlement on stolen land! • Cuisinart: The most exciting new development is the release of the Cuisinart Sparkling Beverage Maker. While other companies have previously offered solid alternatives to SodaStream, Cuisinart is the first with a well-known and respected brand name and wide retail distribution. Priced at $99.95, the machine is now in stock at Bed Bath & Beyond retail outlets as well as Amazon, Cuisinart’s own online store, and other online outlets. It’s available in black, silver, or “metallic red” and comes with one 1-liter, BPA-free plastic bottle and a 4-oz. CO2 cartridge (enough to make up to 16 liters of soda, according to the company). You can exchange the cartridge for a full one ($10 at Bed Bath & Beyond) or buy extras for $19.99. In the near future, Cuisinart also plans to offer exchangeable 16-oz. CO2 canisters that are compatible with the machine. At this writing Cuisinart isn’t selling its own syrups or powder to flavor your soda, but its customer service department says a full line will be available soon. In the meantime, both Cuisinart customer service and at least some Bed Bath & Beyond retail staffers are recommending SodaStream’s flavorings, but if you want to respect the boycott you can just add fruit juice, make your own flavorings, or try the flavor packs offered by two other recent entrants in the make-your-own-soda market, SodaSparkle and Pat’s Backcountry Beverages (see below). Be wary of flavours with the SodaClub brand. It’s the parent company of SodaStream. • SodaSparkle: The new SodaSparkle is a different style of device compared to Cuisinart and SodaStream devices: it’s not a countertop appliance, but a smaller contraption, containing a single-use CO2 cartridge, that you screw into the bottle that comes with it to carbonate its contents. The company offers two starter kits on Amazon and on its own website: the standard one, priced at $50, includes the charger, a 1.3-liter BPA-free reusable plastic bottle, five single-use CO2 cartridges (each one good for one bottle of soda water), and 15 single-glass flavor packs; a $60 “deluxe” kit is identical except that it also includes a 1-liter bottle. SodaSparkle’s CO2 cartridges are made of metal and therefore recyclable, but they are not reusable. A package of 50 additional cartridges costs $24.95 from the company’s own web store or $26.99 from Amazon. Third-party CO2 cartridges are cheaper, but SodaSparkle says you shouldn’t use them. SodaSparkle markets its own line of “fresh, natural, sugar-free, and preservative-free” flavorings; instead of sugar, they are sweetened with sucralose, a non-caloric derivative of sucrose (the basic ingredient of the artificial sweetener Splenda). Current flavors are lemon, pineapple, apple, cola-lemon, tonic, and lychee; more are in the pipeline, according to the company. A package of 60 single-serve packets (for one glass of water) in assorted flavors is $22 from Amazon or $20 from the SodaSparkle site; boxes of 10 “flavor sticks” (each sufficient to flavor one bottle) in the flavor of your choice are around $20 from Amazon and $15 from SodaSparkle. • Pat’s Backcountry Beverages: Based in Talkeetna, Alaska, Pat’s Backcountry Beverages has developed a carbonation system suited for (but not limited to) hikers who want bubbly water in the wild. Instead of CO2 cartridges, Pat’s eco2SYSTEM relies on a combination of food-grade potassium bicarbonate and citric acid powders to produce CO2: to make carbonated water, you fill a special .6-liter (20 oz.) plastic bottle with water, empty a packet of eco2ACTIVATOR (the powders) into the specially designed top, and shake. A kit containing one bottle, six packets of eco2ACTIVATOR, and five samples of Pat’s flavor concentrates costs $40 plus shipping direct from Pat’s online store, through Amazon, or from several other online and brick-and-mortar suppliers of outdoor gear. Extra bottles are $27-$30, while 12-packs of eco2ACTIVATOR powder are $6, plus shipping. Pat’s offers five preservative-free flavor concentrates – Ginger Trail, Lemon Clime [sic], PomaGranite, Terra Cola, and BearFooot [sic] RootBeer – made from natural cane juice. They come in packets designed to flavor 16 ounces of water. 12-packs of each are $34 plus shipping from Pat’s website. • My Pop Old Fashioned Soda Shoppe: If you’re willing to put in a little bit of extra effort in order to go green and save money on carbonated drinks, consider a product called My Pop Old Fashioned Soda Shoppe from My Pop Soda of West Hills, CA. Priced at $75 and apparently available only by mail order from the company’s online store, it consists of seven plastic bottles, six of which are connected by a maze of tubes, clamps, and valves, all packed into a bright green shopping satchel. The beauty of the Soda Shoppe is that you never need to worry about buying, filling, exchanging, or disposing of CO2 canisters – you make your own CO2! All you do is fill one or more of the six connected bottles with a cup of sugar, two teaspoons of baker’s yeast, and cold water, shake each one up, and wait as the yeast digests the sugar and produces CO2. Within two or three days (depending on the number of bottles you filled and the ambient temperature), a gauge attached to the tubing will show that there’s enough pressure to begin carbonating your beverages. At that point you attach another bottle (the seventh one provided, or any standard screw-top glass or plastic beverage bottle) to the system, open a couple of clamps, and listen to the CO2 whoosh in. A single bottle of yeast, sugar, and water will generate enough CO2 to make 10 liters of soda a week, according to the product’s developer; if you need more, you can use up to four bottles to make CO2. You do have to shake the bottle you’re filling for a minute or two to achieve good carbonation, and every month or so you have to take the system apart, rinse out the bottles and tubes, and start the process all over. That’s more work than the other products require. But in return you will save quite of money – the cost of the sugar and yeast comes out to only pennies per liter of liquid you carbonate; with the other products, you can spend 10 or 20 times as much for CO2. And from an environmental point of view, you’re making a one-time investment in plastic bottles, tubing, etc., but thereafter you won’t be using anything except sugar, yeast, and water. • Primo Flavorstation: Primo Water Corp.’s Flavorstation 100 ($70) and Flavorstation 120 ($80), which were previously recommended here, are still available at the company’s online store, on Amazon, and possibly at some retail outlets, but Primo has announced that Cuisinart will take over sales and marketing of the devices, and Primo will supply CO2 cylinders for the Cuisinart appliances. Please pass this guide along to others. May clean bubbles arise! Exciting news from an otherwise uniformly bleak picture of Israel’s upcoming elections. Published online today by Challenge magazine. Asma Agbarieh-Zahalka, Tel Aviv, September 2011. A little context: When I was in Palestine-Israel writing Our Way to Fight, veteran labour activist Michal Schwartz introduced me to the Workers’ Advice Centre and the Organization for Democratic Action, now called Da’am Workers Party. An enormously stirring revelation. by Shany Littman. Reprinted by permission from the January 5 Haaretz Weekend Supplement, translated from the Hebrew by Barbara Rosenstein. 2645. That’s the number of votes the Da’am Party received in the previous elections. 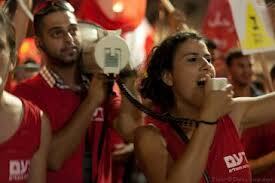 But since the outbreak of social unrest, the socialist Da’am party has become a hot trend in Tel Aviv. Party leader Asma Agbarieh-Zahalka explains why poverty is no less an evil than the Occupation, why she wouldn’t have sailed on the Marmara, and why there is still hope in the Middle East. Asma Agbarieh-Zahalka is ecstatic. For the first time she sees clearly that the way to the Knesset in Jerusalem is shorter than ever. She is convinced that this time the Da’am Workers Party, which she chairs, will cross the threshold, despite the fact that tens of thousands of votes stand between success and the 2645 votes received by the party in the 2009 elections. In an interview I conducted with her before the last elections four years ago, she seemed more introverted, more serious, working diligently yet without hope. But something has changed in four years, something that even she never envisioned would happen so quickly, although she had been waiting impatiently. From David Shulman in Jerusalem, January 4, 2013. He teaches at Hebrew University, and wrote the book Dark Hope. — I meet the drummers on the city bus to French Hill. They ask me: “Are you going there?” Yes. Smiles. I tell them I’m happy to see the big drum again; it brings up good memories of Sheikh Jarrah, the demonstrations two years ago and more. There the drums made all the difference. They say to me: “You’re an honorary drummer.” Now that’s worth putting on my CV. — The Border Police are, of course, waiting for us at the gas station at the edge of the village. Quite a lot of them and, at first glance, far too few of us. Even the contingent from ‘Isawiyya that marches uphill to welcome us and guide us in is sparse, too sparse. I’m expecting a violent response by the soldiers today in line with recent developments. I wonder: Will I ever get used to this? I have a strong, demoralizing sense of déjà vu. I’ve trained myself not to be afraid of the tear gas and the stun grenades and the clubs and even the rubber bullets, but I don’t like them. Slight rumbles in the pit of my stomach. Recently Shabak (aka Shin Bet) ‘invited’ Kobi Snitz to their office for interrogation. A fascinating account of it follows below. It’s written by American commentator Richard Silverstein, who followed up the story first published by journalist Amira Hass this week in the Israeli newspaper Haaretz. “My politics developed while I was away,” he said. “Meeting Palestinians and Arabs at school in Toronto and Maryland heightened my sense of the need to build new kinds of relationships with Palestinians here. When I came back in 2003, that seemed the most important thing to do.” And so he has done since then. This is why the Israeli secret police don’t like Kobi Snitz. A few days ago, Amira Hass wrote a story in Haaretz about a Shabak interrogation of Israeli peace activist, Kobi Snitz. Snitz is a mathematician at the Weizmann Institute and a member of a pro-BDS group in Israel called Boycott from Within. He is also a member of Anarchists Against the Wall. Snitz and several hundred other Israelis signed the group’s manifesto, which in turn brought many of them to the attention of the secret police (another term I use for Israel’s intelligence/security apparatus). Twenty-five years ago this month, young Palestinians launched an uprising that came to be known as the First Intifada. It wasn’t the first uprising against the Israeli military occupation of Palestine, but the first to reach widespread international attention. This riveting account by Sandy Tolan, published yesterday on Mondoweiss, documents its roots and its course. Author of The Lemon Tree: An Arab, A Jew, and the Heart of the Middle East, Tolan is an associate professor at the Annenberg School for Communication and Journalism at USC. On December 8, 1987, in the Gaza Strip, four Palestinians were killed when an Israeli truck or troop carrier veered into a long line of cars carrying day laborers home from Israel. This was the spark that lit a furious response, and spread quickly from Gaza across the West Bank and into the refugee camps. Boys and young men known as the shebab forged the front lines of what started as a spontaneous eruption against the killing of the four workers, but was fueled by a much deeper anger at decades of foreign rule. For more than 20 years, the occupying power had dictated nearly every aspect of public life. Israel ran the criminal and military courts, banned and approved textbooks, erected roadblocks and checkpoints, and levied special taxes so that, in effect, Palestinians were paying to be occupied. Permits were required to dig a well, plant a tree, repair a house, raise chickens, or travel to Jerusalem, the spiritual heart of the Palestinians for Muslim and Christian alike. National flags were banned, schools and universities shut down, protest leaders expelled to Jordan or Lebanon, and young men routinely rounded up and placed in “administrative detention” for weeks or months without charge. By 1987 the military had built a vast intelligence network, paying local spies, or issuing them coveted travel permits, in exchange for their eyes and ears in the camps. The shebab were but one element of what became, for a time, an exceptionally unified, clandestine and well-organized campaign of national resistance. The atfal al hijara – children of the stones – were only the most visable symbol of the first intifada, or uprising: the vanguard of a war of liberation that cut across class, religion, and political affiliation. The people’s leaders in the Palestine Liberation Organization were in exile, in Tunis and Algiers, but quickly an anonymous local command emerged. Unambiguous directives — demonstration Noon today, at Manara; general strike tomorrow, no business may open — appeared overnight, scrawled on the camp walls, scattered in unattributed fliers, or shouted out by Palestinian fruit market vendors amid their cacaphonous hawking of watermelons and figs. SEVERAL years ago I was invited to speak at Melbourne’s Jewish Museum on the subject of “The cartoonist as society’s conscience”. I gladly accepted but within a week was informed by the museum that the invitation had been withdrawn because of my views on Israel. Although I had been somewhat critical of aggressive Israeli government policies I had never publicly outlined my broad views on Israel and was puzzled by the cancellation and bemused by the gross irony of being excluded from a discussion about conscience because I had acted with conscience in my work. Upon reflection I wondered if an internal philosophical disagreement lay behind this peculiar cancellation. Whatever, a door had been closed to me. I relate this tale as a backdrop to more recent circumstances in which it has been publicly inferred that I am anti-Semitic because of a cartoon I created expressing sad dismay at the plight and suffering of the Palestinians in the recent bombardment of Gaza. As a cartoonist I am not interested in defending the dominant, the powerful, the well-resourced and the well-armed because such groups are usually not in need of advocacy, moral support or sympathetic understanding; they have already organised sufficient publicity for themselves and prosecute their points of view with great efficiency. The work of the artist is to express what is repressed or even to speak the unspoken grief of society. And the cartoonist’s task is not so much to be balanced as to give balance, particularly in situations of disproportionate power relationships such as we see in the Israeli-Palestinian conflict. It is a healthy tradition dating back to the court jester and beyond: to be the dissenting protesting voice that speaks when others cannot or will not. My recent cartoon (“First they came for the Palestinians … “) was a lament based on the famous lines attributed to Pastor Martin Niemoller that neatly highlight the way apathetic or frightened silence in the face of injustice is a dereliction of moral duty. It is interesting to note that Niemoller had been an active Nazi supporter but a decade after the war became a pacifist. Although greatly valued in contemporary Jewish culture, the poem’s message is universal and eternal; it could apply to any oppressed group, including the Palestinians who, even with their relatively feeble rockets, are so obviously oppressed. In spite of all the highly organised rhetoric justifying Israel’s actions, the intuitive, heartfelt moral shape of the situation is becoming clearer and more obvious to the world the longer the conflict goes on. When all is said and done, it looks like the Palestinians have been massively robbed and abused, and are engaged in a desperate struggle for survival and liberation. Israel on the other hand would appear to be conducting an imperialistic campaign of oppression supported and substantially armed by the most powerful nation on earth. My cartoonist’s duty and conscience compel me to focus on the plight of the subjugated, the ones most neglected, severely deprived and cruelly afflicted. I am not against Israel but I am opposed to what I regard as its self-defeating, self-corrupting militarist policy, which is not only excessively homicidal and traumatising but sows the seeds of irreversible hatred and can never bring a lasting peace. One expects more from a prosperous democratic country. It’s as if this young nation Israel has not yet come to maturity; so delinquent, irresponsible and unwise are its actions. I sense that the Jewish community in this country is itself increasingly divided on the question. I also suspect that the more aggressive Israel supporters fear this moral unease and quiet doubt in their community and are angered by any cartoons or commentary that might encourage such doubt. In spite of what the bullies say, I suspect they are not really upset by any “anti-Semitism” in my cartoons (there is none) but by the possible impact of a cartoon on the doubters. The better the cartoon, the more it must be discredited. What cheaper way to discredit than the toxic smear of anti-Semitism. I am not sure whether it is legal to publicly call someone an anti-Semite without evidence but it certainly feels like hate talk to me, as well as a damaging thing to say about someone who does not agree with you. That’s often why it is said of course. Over the years it has been implied that I am “a second degree anti-Semite”, “a new-world anti-Semite” and a “latent anti-Semite” as well as a simple old-fashioned common or garden anti-Semite. I now learn to my amazement that to make comparisons between Israeli policy and any Nazi behaviour is in itself an anti-Semitic act. So much for free speech. I say all nations that throw their military weight around, occupying neighbouring lands and treating the residents with callous and humiliating disregard are already sliding towards the dark possibilities in human nature. My cartoons have also had me labelled a misogynist, a blasphemer, a homophobe, a royalist, a misanthrope and a traitor, to name but a few. I would sum it all up by saying: I am a cartoonist. Yesterday, Thursday November 29, 2012, the United Nations General Assembly voted to approve Palestine’s bid to become a non-member observer state. The final vote stood at 138 in favor, 9 against and 41 abstentions. The United States voted against the measure along with Israel, Canada, Czech Republic, Panama, Palau, Marshall Islands, Nauru, and Micronesia. Each of these is a colony or an ally of the US; some are both. The abstentions follow a similar pattern. After fighting tooth and nail to block a positive vote, the United States and Israel immediately claimed that it meant nothing. It’s not a real state, they said in one voice. Subtext: In the Security Council, the US will continue to veto the admission of Palestine to full equality in the UN. The wall still stands, the Israeli occupation continues, so does the siege of Gaza. The US government will continue to fund these crimes. The governments of Canada, Britain, Australia – each of which, like Israel, is built on land and resources stolen from indigenous peoples – and some other regimes in the US corral will continue to justify these crimes. So will the vast majority of the mainstream media. Even so, this is a new day. 138 countries defied relentless bullying from Israel and the US, to assert the inalienable right of Palestinians to equality, justice and peace. November 29: Another step on a very long road to freedom for the people of Palestine. We are still needed. Stay connected. Stay involved. Hours from now, Mahmoud Abbas, the President of the Palestinian Authority, will speak to the United Nations General Assembly and ask 193 countries to vote for non-member observer status for Palestine. With support expected from as many as 150 countries, the bid will likely pass easily. This vote will not create an independent Palestinian state. [MR: Only the Security Council can grant statehood; the US vetoed a Palestinian bid last year.] But despite its limitations, Jewish Voice for Peace supports this initiative in the General Assembly. A successful bid will demonstrate that the majority of the world’s countries support Palestinian political and social rights. It could give Palestinians the ability to hold Israel accountable, for the first time ever, in the International Criminal Court. Israel and the United States are lobbying furiously against the bid [MR: So is Canada]. Both countries claim they support Palestinian independence, but have worked non-stop against a just and lasting peace for both peoples. Should this bid succeed, Israel and the US have threatened retribution against the Palestinians and the UN. Powerful members of the U.S. Congress have already introduced an amendment to a budget bill that would pull U.S. funding from countries that support the bid, and to punish the U.N. itself. Today represents a critical opportunity for the rest of us. Today people will read, see, hear about Palestine/Israel in blogs, newspapers, Facebook, everywhere. They may wonder: why are Palestinians stateless? Why are they fighting? Why are Israel and the United States opposing most of the world? At Jewish Voice for Peace we’ve put together a 6-minute animation that explains why Israelis and Palestinians are fighting. It’s not meant to be comprehensive, but a simple tool about the conflict as a struggle for equal rights. Let’s help people to understand why this UN vote matters, why so-called ‘peace talks’ have failed, and how we can make a difference, now, in our homes and schools and workplaces. Voices for a just peace will not be heard through the mainstream media. By posting and forwarding this video any way you can, you’ll help ensure that such voices get a hearing. Israel continues to impose its suffocating, illegal siege on 1.6 million Palestinians in what UN officials have called “the world’s largest prison.” For a compact, stark account of the siege, read Sara Roy in The Boston Globe, ‘Where’s our humanity for Gaza?’ Sara Roy is senior research scholar at the Center for Middle Eastern Studies, Harvard University. Israel continues to shoot at Palestinian farmers trying to work their land, and at Palestinian fishers trying to fish in Palestinian waters. Fresh water in Gaza continues to disappear, and becomes increasingly undrinkable because Israel prevents access to the materials needed to repair and operate the water purification plant which it bombed. Reconstruction after each Israeli assault depends on materials which Israel blocks from entry through the checkpoints, the prison gates. Similarly the medical supplies to repair human damages. And so on, in every sphere of life. Meanwhile, the United States continues to prop up Israel unconditionally with billions of taxpayer dollars, while the US economy fails most of its own population. Current regimes in Canada, Britain, Australia and most of Europe continue to grant Israel carte blanche to do as it wishes. At the same time, BDS – the international movement for boycott, divestment and sanctions – continues to grow, as the most effective way for the rest of us to challenge these crimes. 1. Due to the long Israeli siege, Gaza’s medical system was already badly damaged before this latest assault. Now it has to deal with a wave of traumatic injuries. Medical Aid for Palestine (Canada) gets vital support to grassroots health-care organizations in Gaza. Medical Aid for Palestinians (UK) does the same. Israel will continue to wage war on the Palestinians until the cost becomes prohibitive. The boycott, divestment and sanctions (BDS) movement is an effective way for people of conscience around the world to show solidarity with the Palestinian struggle and hold Israel – and all complicit institutions — accountable for occupation and apartheid. The BDS movement has already made significant gains, causing economic damage to companies that support Israel’s crimes, persuading artists not to perform in Israel, winning support from major churches, trade unions and social movements, as well as pressuring governments to take action. 2. Boycott Israel. Don’t buy Israeli goods. Profits from exports from Israel help to fund the Israeli government and its crimes against the Palestinian people. Refuse to buy Israeli goods and tell retailers that you are doing it. Persuade friends and family to stop buying any Israeli products too. Brands to avoid include Ahava, Jaffa oranges, Sabra and Tribe hummus and SodaStream. 3. Join an active BDS campaign or start a new one. Initiate action in your institution, union, group, etc., against the companies and organisations that support and profit from Israel’s system of oppression over the Palestinian people. For example, in the US, campaigners have pressured major pension funds to divest from Caterpillar, a company that provides bulldozers used to destroy Palestinian homes. Public bodies across the world have been successfully pressured to stop awarding contracts for public services to Veolia, a company that provides infrastructure to illegal Israeli settlements. Veolia has lost contracts worth more than $14bn following BDS campaigns. Campaigners recently persuaded a major bank to divest from G4S, a private security firm involved in Israel’s crimes against Palestinian prisoners, including children. You can find out more about campaigns taking place in your area by contacting your local Palestine solidarity organisation. There’s a great online database of Palestine solidarity groups here. 4. Organise a BDS protest action. Demonstrations, banner drops and flashmobs are great ways to raise awareness of the boycott of Israel. Some actions target particular products, like the actions against Israeli cosmetics company Ahava, while others take place in supermarkets and remind shoppers not to buy Israeli goods or to target complicit companies. There’s a useful guide to planning a BDS action here. The guide is written specifically for the Ahava campaign, but it’s full of useful ideas for similar campaigns too. 5. Urge organisations that you are a member of to divest from Israel. Trade unions, student unions, faith groups and other organisations all over the world have passed BDS-related resolutions calling for divesting from companies profiting from Israel’s occupation. The US Quakers’ investment entity recently sold its shares in Hewlett Packard and Veolia, two companies supporting and profiting from Israeli violations of international law, after having divested from Caterpillar a few months ago for the same reasons. Student unions around the world have voted to support divestment and have successfully campaigned to have companies like Sabra Hummus and Eden Springs removed from their campuses. Trade unions can participate in BDS campaigns and sell any investments they may hold in Israeli companies or raise rank-and-file awareness about Israeli products to boycott. Ask organisations that you’re a member of to hold a meeting to discuss education about and support for the BDS campaign, and find out if it’s possible to pass a resolution to support BDS when the time is right. 6. Pressure elected officials to impose a military embargo on Israel. Military ties with Israel feed and encourage further Israeli violence. Israel wouldn’t be able to maintain its occupation and apartheid system over the Palestinian people if it wasn’t for the military aid it receives from the US or the military trade it conducts with countries around the world. Urge your government and elected representatives to support a military embargo on Israel. Please, stand with the people of Gaza now. They need us. From The Real News Network, 16 November 2012: UN Holds Urgent Security Council Meeting, US Stands With Israel. No surprise there. Of 79 United Nations resolutions the US has killed with its veto power at the Security Council, 42 have been critical of Israel. The United States remains Israel’s most faithful supporter and most lavish funder, even as the US economy fails the vast majority of its inhabitants. In Canada, the government and the opposition parties either egg the bully on or remain shamefully silent. Same in Britain, Australia, France, and so on. Here too, no surprises. For the 1% who control state power in the so-called western democracies, Israel’s aggression is comfortably familiar; it seeks to emulate precisely the violent grand theft of the Americas and other continents by European invaders. Which is to say, Palestinians in Gaza face the most powerful and by far the most aggressive military state in the Middle East, backed by the most powerful and aggressive military state on the planet. In a compelling eye-witness report, human rights advocate Adie Mormech writes from Gaza today, under Israeli bombardment. And ends with an urgent plea to the rest of us who are not comfortable with crimes against humanity currently being committed in our name.